Coca-Cola Bottling Company of Winfield, KS has been a long-time supporter of Cowley College and the Tiger Booster Club and had been looking for a way to make a long-term focus on athletic scholarships at the school. The company, which has had a decades long relationship with the college, accomplished that goal by recently establishing a new $15,000 endowed scholarship through the Cowley College Foundation. 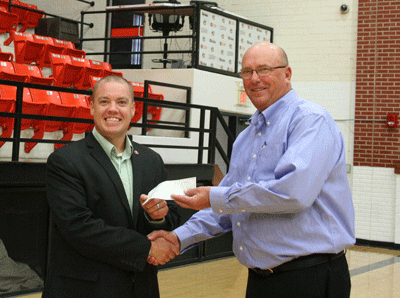 The proceeds of the fund will go to support scholarships for Cowley’s student-athletes. Ben Schears, Cowley College vice president for institutional advancement, said Ron Hutto, manufacturing executive at Coca-Cola Bottling, was instrumental in creating the scholarship. “It’s wonderful to have donors like Ron (Hutto) and Coca-Cola Bottling who care about a long-term sustainable vision for the college and are willing to step up and endow a scholarship to support our programs,” Schears said. Hutto said the company is always looking for ways to support local schools, especially when there can be a direct benefit to students.